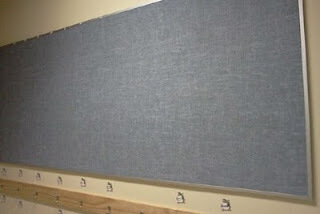 The bulletin board outside of our classroom is a 4'x10' space that we use to highlight student work. It is a large area that requires some creativity to display a student's learning. I have always tried to be unconventional in my approach with the space and almost always go big. I like to blow out the borders of the aluminum framed board by pretending they are not there. The last display reflected our concluded spatial knowledge unit and used oversized continents, maps and compasses. It was a big hit with students and parents alike. The expectations are high each time the old stuff comes down and the canvas is prepped for the next project.The self-imposed problem is how do we top or match our last display. I usually complete the new board on my day off. I like to go from nothing to wow, when no one else is around. I can work messily , turn the music up, and sing without interruptions or embarrassment. One of the online tools I had saved in my Delicious quiver was Block Posters. The free website allows users to create wall sized posters from their uploaded images. Our recently concluded Water Cycle was the perfect opportunity to give it a try. 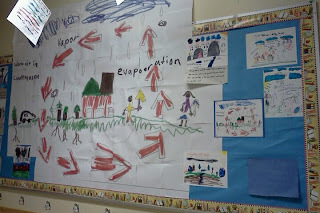 I chose a student piece that incorporated unit vocabulary and was a good representation of what we learned as a class. I scanned the work and re-sized it to fit into the website image limit of 1mb. The website accepts formats JPEG TIFF GIF RAW BMP JPG PCX etc. Once uploaded, step two is to slice up your image, choose the orientation, and the final size of the poster. Once the user is satisfied with their setup, they choose continue to get the link to download their file. The PDF file can then be printed, but you must be sure to print so that the image takes up the entire piece of paper. A mistake that I made, that required some paper cutting duties in the library. Once printed, you piece the prints together in a puzzle or mosaic to form the enlarged image. Mine came out at aobut 7.5' by about 5.75'. I added some more student work on the periphery, displayed the standards that we taught and let the exhibit speak for itself. Block Posters has a lot of potential for teachers. You could use the site to create larger reference posters, class photos, tracking charts, and anything that a teacher might want to 'Go big' with.